After more than 260 years on the map, Alexandria has accumulated countless tall tales, housed legendary prominent citizens, perpetuated amazing architecture, and flourished into an award-winning culinary hotspot. Explore the history and culture with a historic food tour, take an invigorating bicycle ride to Mount Vernon or hop on a boat and tour the majestic monuments of our nation&apos;s capital just minutes away. 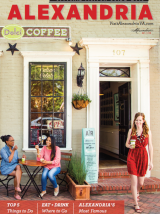 Whether you are on foot, bike, boat or motorcoach, experiencing Alexandria and the nearby region is always fun.